Alcoholism and drug dependence and addiction, known as substance use disorders and rehabilitation treatments are classified as substance abuse treatment. Some of the common symptoms of drug abuse are aggressiveness, irritability and forgetfulness. Doctors and physicians recommend community resources for the patients willing to quit the substance abuse along with certain medications which help in controlling the cravings and manage the medical complications resulting from substance abuse. Globally growing number of people addicted to such substances and increasing awareness about such treatments are expected to be the key growth drivers during the period of study. Geographically, North America dominates the Substance Abuse Treatment market owing to the higher usage of the Cocaine and opioid by the people which results into higher demand for the drug abuse treatments due to higher awareness and spending by people on such treatments. North America was followed by Europe and Asia-Pacific as second and third largest markets for Substance Abuse Treatment market. Asia Pacific is projected to have the fastest growth, owing to growing consumption of alcohols, drugs and other such substances by the youth in the region and growing awareness about such treatments in the region and government initiatives in developing nations such as China and India in this region. This report identifies the global Substance Abuse Treatment market size in for the year 2014-2016, and forecast of the same for year 2021. 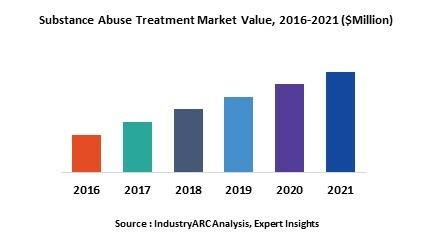 It also highlights the market drivers, restraints, growth indicators, challenges, and other key aspects with respect to global Substance Abuse Treatment market.